To tell you the truth, I have been totally and utterly flabbergasted by the 'coup d'état' which took place in Mali last week. Or perhaps I should use the word "dumbfounded", - if only for the inclusion of the word that immediately springs to mind: "dumb". For how stupid can you get if you think that overthrowing the government of a respected and liked president like Amadou Toumani Touré is going to solve anything, let alone the trouble Mali is having with rebel groups in the v-a-s-t northern regions of the country? The effect is as predictable as it is sad. Mali's reputation as a democratic and stable country, which was carefully built up over the last twenty years, is shot. The reaction to the coup has been resolutely negative, both from African countries and from influential countries like the former colonial power France. Inside the country Malian citizens are in dread of the present (with disorderly troops roaming the streets of the capital), and in fear of the future, with the food situation already getting perilous (prices are doubling from one day to another). 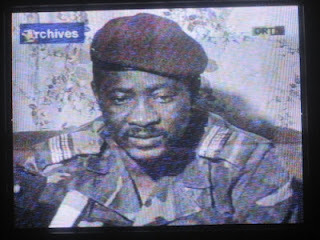 What can possibly have inspired this captain Amadou Sanogo to execute this coup? Does he seriously think that a coup is going to make an end to the "incompetence" he accuses A.T.T. 's government of in handling the Tuareg crisis in the north? The fact that A.T.T. also led a coup d'état, exactly 21 years ago today (i.e. on March 26, 1991), can not be used as an excuse for this coup. Even the fact that the Tuareg rising played a (marginal) part in the 1991 coup can not be used as a justification. The coup in 1991 came after a long period of protests against an autocratic government that had done its utmost to resist any form of democracy, and that had long lost the support of the population. A.T.T. can not be compared to Moussa Traoré. For further reading about Amadou Toumani Touré I advise you to read the paragraph on him in the Wikipedia. For now, I would like to share with you a cassette from 1991 (the year in which A.T.T. overtrew Moussa Traoré), bought in Mopti (the town where A.T.T. was born), and recorded by one of my favourites "vendeurs de cassettes" in the local market: Amadou Fofana (more of his cassettes in future posts). The subject of the cassette is A.T.T. himself. And I have no doubt the song is in praise of the man. About the artist(s) I know absolutely nothing, apart from the fact that they sing in Peul. Please don't think that the stream has dried up. I have been very busy digitising more cassettes and records. Given the small amount of time I have this has kept me from sharing more musical wonders with you in the last fortnight. In this post I would like to revisit the music of one of my favourite orchestras: Franco's O.K. Jazz. 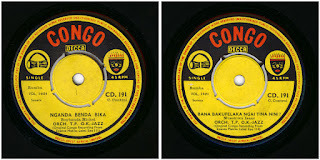 And in particular I would like to share more examples of the musical talent of Lola Djangi a.k.a. Chécain (see this post, and many others). In my earlier posts I wrote about his role as a vocal "deuxième". This usually means the lower of the voices in a song. In this position out of the limelight Chécain's voice can at times - by those unfortunate beings who are less acquainted with the work of the O.K. Jazz - be mistaken for the voice of another vocalist. I can particularly understand his voice being confused with Franco's. Those who have heard his interpretation of "Mario", after Franco's death, will have to agree that - apart from the power which came from Franco's assertive personality - it was the closest anyone has come to Franco's original in sound and timbre. But luckily Chécain has found another way to 'make his mark'. In the majority of his songs he manages to insert some kind of spoken comment. In the first of these six songs I am sharing with you in this post. "Ta Noel", he can be heard after 33 seconds, - exactly the same moment as his intervention on the B-side "Bana bakufelaka ngai tina nini?". 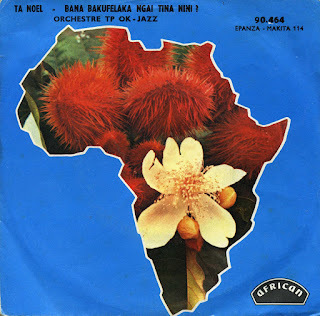 According to the label of this single on the African label, but originally released on Franco's Epanza Makita, the single was produced in 1970. 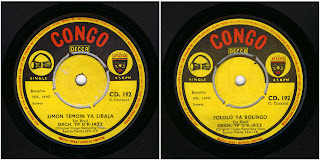 Although dating in this period is a tricky business I think this must be correct, given that Chécain's "Emilie Na Gabon" and Youlou's "Likweyi" (both on Sonodisc CD 36520) were released as Epanza Makita 100 and 101. Of the singles released on the Epanza Makita label relatively many remain undigitised. And the singles of this period that háve been digitised have sometimes been sadly mistreated. 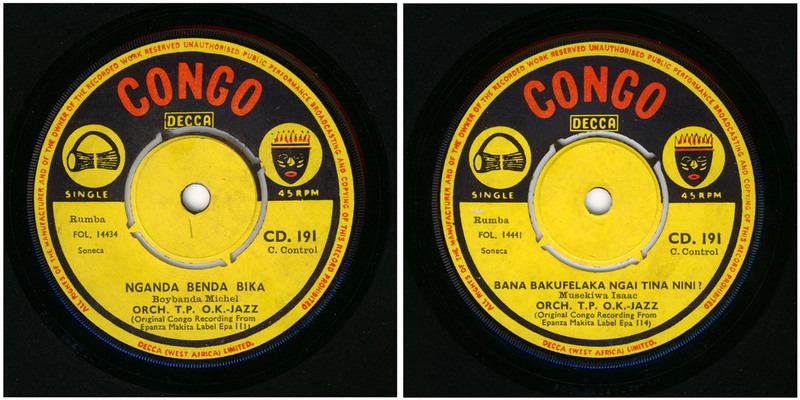 The second single was released on Decca's Congo sublabel. The B-side of the single is the same as the B-side of the first single. 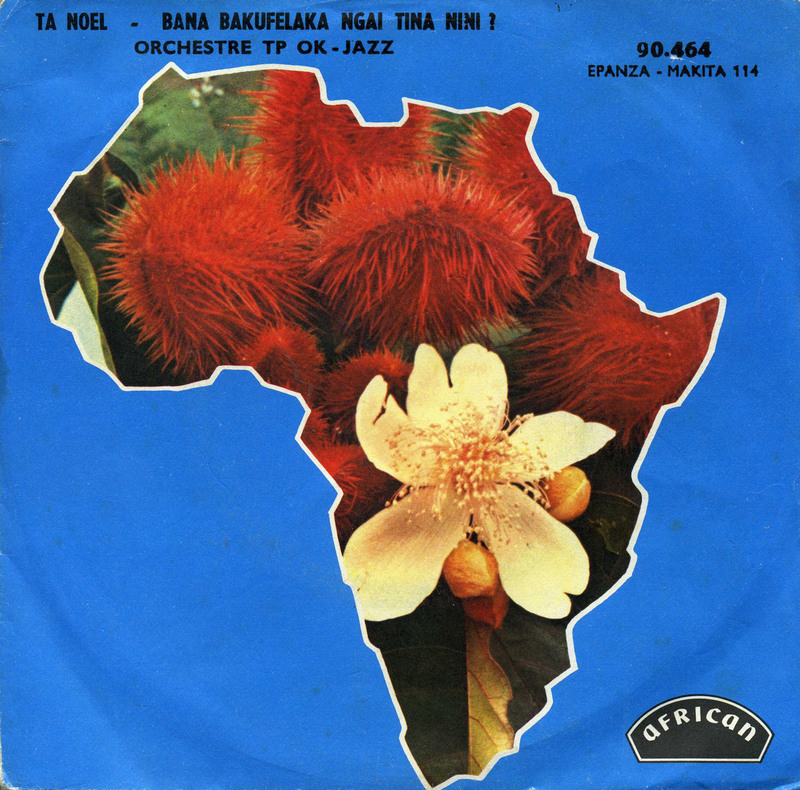 The A-side was originally released as Epanza Makita 111, with "Nabanza tele" on the flipside (according to Ewens). This song, "Nganda Benda Bika", was composed by Michel Boyibanda, who is also one of the three singers. The others are, yes you guessed right, Youlou and Chécain. In this song Chécain is perhaps a bit harder to discover. He is certainly not responsible for the spoken incursion after 52 seconds. To be honest I don't really know who is talking there. Any ideas? The quality - 'vinylwise' - of this single is disappointing, as is the case with most of the singles I have heard of this label. I am not sure if this is a problem of aging or one of intention on the part of Decca. In case you are wondering: the A-side of the next release on the Epanza Makita label, Epanza Makita 112 was "Bolingo Marie-Angele", composed by (who else?) Chécain, and digitally released on Sonodisc CD 36514. This is a track very much in the vein of "Ta Noel"/"Bana bakufelaka ngai tina nini? ", - with Chécain's trademark comment at almost exactly the same point in the song. Our friend again features in the next single, released originally as Epanza Makita 113, but here in the Decca Congo version. On both sides he is backing Michel Boyibanda, and this appears to give him almost an equal spot in the vocal balance. Particularly in these two songs the resemblance to Franco is noticeable. 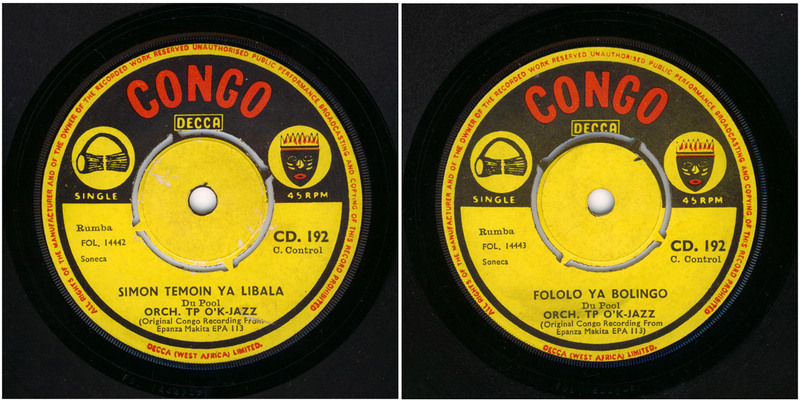 Listening to the opening of "Simon Temoin Ya Libala" (I suppose this means "Simon witness at the wedding") one wonders what Chécain contribution was in this composition by drummer/conga player Jean-Félix Pouéla a.k.a. Du Pool (who I think I mentioned earlier*), as the bride appears to be his dearest Emilie ("Emilie mon amour"). The same Emilie as the one in Gabon (see above)? 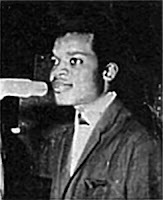 Chécain certainly has composed songs about his own experiences. In both songs he is a bit late with his chat. He doesn't show up until after 0'50. I must add that someone else takes over after him (after 0'56) in "Simon Temoin Ya Libala". I like these two songs, despite the poor record quality. Although they don't radiate brilliance on the level of Franco's Great Hits, they are good enough for a modest spot in the limelight. All three singles can also be found, bundled together, here. * and who I as I recently noted also played on that classic Papa Noel album "Bon Samaritain", with that glorious voice of Carlyto. I have been rummaging through my archives again and dug up some cassettes by Malian female singers. Singers who are perhaps relatively unknown in the western world. And there is a good reason for this, as Kandia Kouyaté (see earlier post, post and post) once explained to me. One reason is that the music of these singers is uniquely directed at the local market. They sing at ceremonies like weddings and baptisms, at soirées (or 'sumu') and such. The scale of these events is usually such that most participants or persons attending are known to the singer, or people assisting the singer. And that brings me to another, no - to the number one reason. This is, of course, an economic one. By praising, or at least singing about, respected, respectable and/or self-respecting members of the community the singer can make a good living. And in some cases even an excellent living. Anything from money, handbags, jewelry, items of clothing (pagnes but also silk, embroidered dresses etcetera) to cars and villas can be bestowed on a talented artist. The extent of gratitude on the part of the receiver of the praise is largely dependent of his or her social prestige, or at least the perceived social prestige. But that is the subject of a future post. This post is about one of the more succesful griots: Naini Diabaté. When I first travelled through Mali in the 1980s, there were plenty of stories going around about this singer, who was born in Bamako in 1963. One of the more spectacular ones was that Naini, being blind in one eye, during a heated performance had miscalculated the extent of the stage and had fallen into the crowd. Others claim that she was the first female griot to perform on Malian television in 1983, at the newly constructed (and Libyan funded) broadcasting centre of the R.T.M.. I have my doubts about this claim, but it is reasonably certain that Naini Diabaté rose to fame as a result of her television performances. Seeing this video from a performance in (probably) 1988 will give you an idea why. Naini in turn repaid the R.T.M. by singing its praise. And, if you ask me, this praise is well deserved. For the Radiodiffusion Télévision du Mali, which was renamed "Office de Radiodiffusion Télévision du Mali (ORTM)" in 1992, has served Mali - and in particular Malian culture - well. Not just by the many televised performances by Malian artists, but also by the wide range of audio recordings made at their studios. Many of which - by the way - were subsequently released on record or cassette outside Mali. This is not the case with the cassette Naini recorded for Beny Mariko's label in 1988. I really like this cassette. And not just for the memories which it evokes for me. Not just in the title song "R.T.M." (yes again), but particularly in songs like "An Sako Be Ke", with its variety in amplitude, and the deeply soulful "Sory", the overwhelming "Diamou Niagale" and the skillful "Diagneko" Naini Diabaté demonstrates her maturity and tremendous power as a singer. You can find more great videos by Naini Diabaté on Ngoniba's great Youtube channel.